Summary: Since the terrorist attack on French satirical magazine Charlie Hebdo, the country's Muslim community, despite universally and repeatedly condemning the attack, has come under a wave of misguided "reprisal" attacks. A boar's head and entrails were left outside an Islamic prayer center in Corsica with a note: "Next time it will be one of your heads." 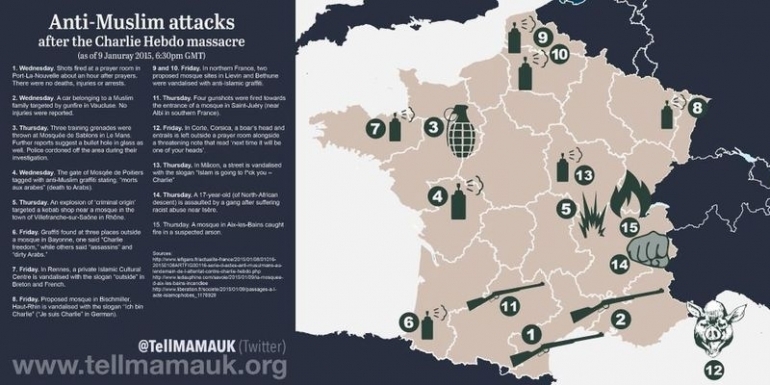 The attacks have been relatively small-scale, especially compared to the Charlie Hebdo massacre and subsequent violence committed by its apparent culprits. The only serious harm so far came from a gang assaulting a 17-year-old of North African descent. But these incidents point to a long-worsening trend of hostility in France toward the country's Muslim minority, which makes up an estimated eight to 10 percent of the population, and a sense among French Muslims that they are not welcome. The growth of France's Muslim population has led to deep concern about what that means for France's secular traditions. The government banned head scarves and other religious symbols from public schools in 2004. In 2014, they banned concealing one's face in public — a ban widely seen as targeting burqas and niqabs and suggesting that devout Muslim women were unwelcome in public life. Of course, a ban on Muslim head coverings is nowhere near the same things as this spate of anti-Muslim violence, but both are rooted in a similar hostility toward Islam and Muslim immigrants in France, and contribute to the sense of siege among French Muslims.